When it comes to political gaffes, Marco Rubio’s nationally televised cotton-mouthed lunge for a water bottle ranks as a pretty minor one. And now, of course, it has become Minor. 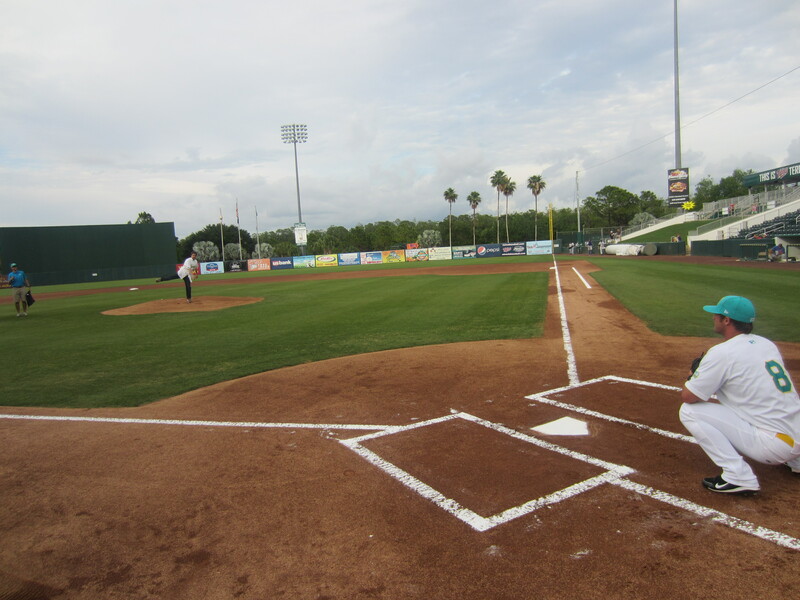 This past Thursday, the Fort Myers Miracle announced that they will be staging a “Marco Rubio Water Bottle Giveaway” at a to-be-determined point during the 2013 season. Fans entering Hammond Stadium will receive a water bottle while being encouraged to gather in the shady parts of the ballpark to stay cool when the heat is on and prevent perspiration. 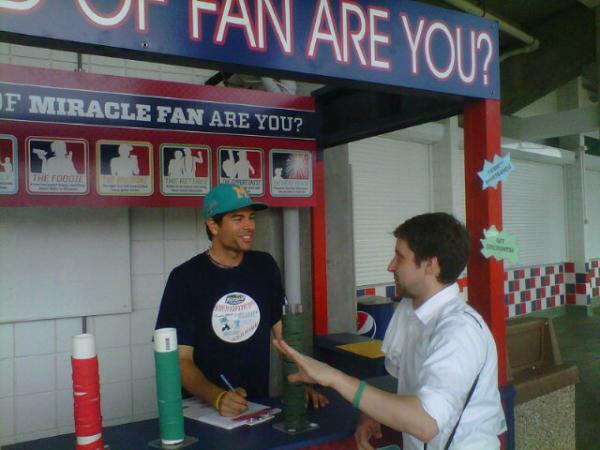 The Miracle will help recreate Rubio’s thirst-quenching moment on national television by setting up a booth where fans can put on a sports jacket, stand in front of a set and down some high-quality H2O. Those picking up tickets at the will call window should be prepared for unlicked ticket envelopes because our parched Capital Bank ticket office employees will be saving saliva. Fans will need to salvage water water wisely with special deals on high-sodium concession items such as chips, popcorn and peanuts. 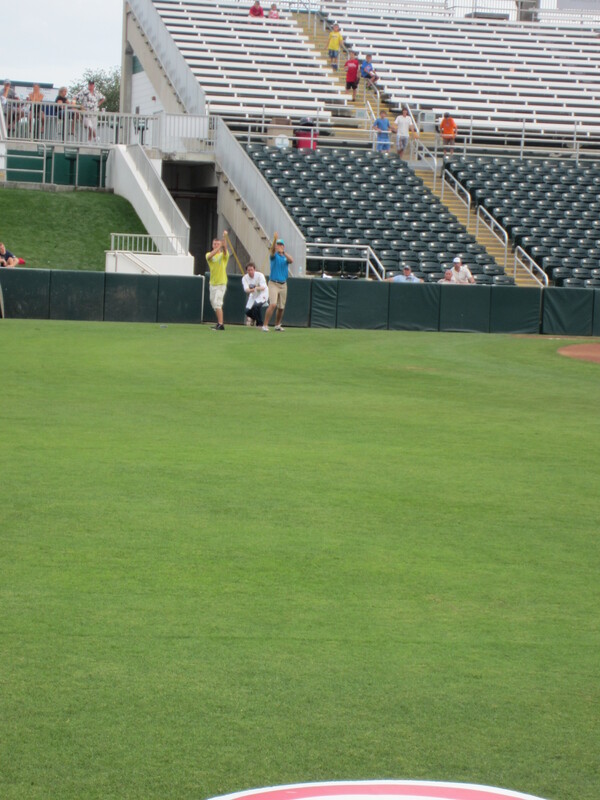 In an effort to keep the field saturated, the Hammond Stadium groundscrew will participate in a mid-game rain dance because even the Earth needs a drink on a hot day. 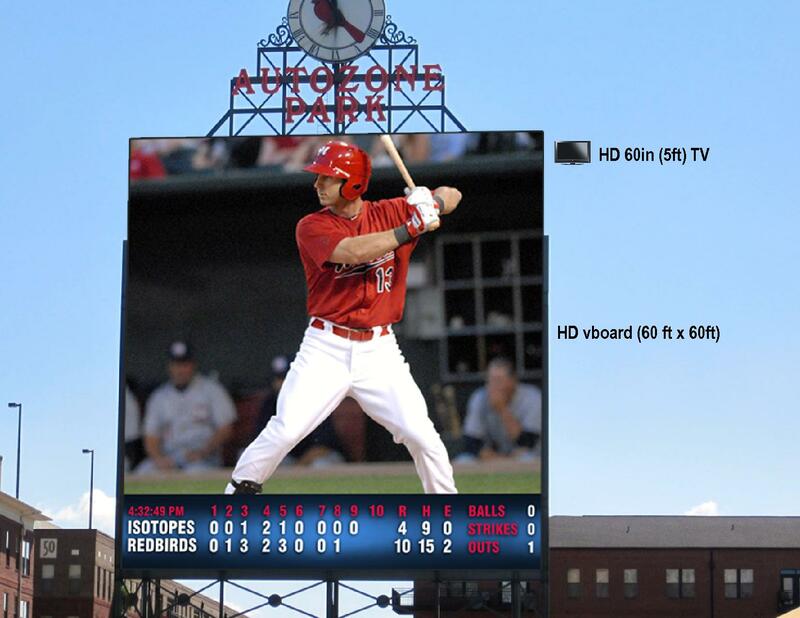 Fans can expect to make a big splash with a stadium-wide game of Marco Polo. 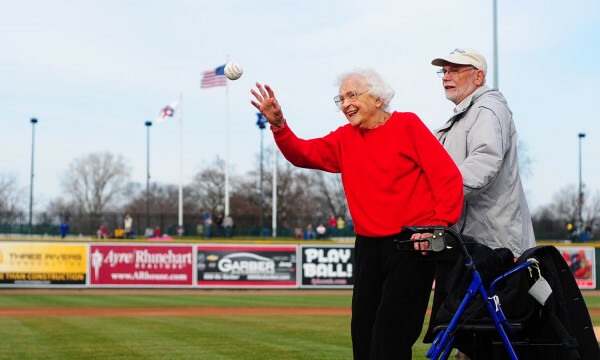 Of course, the Miracle will extend an invitation to Senator Rubio to throw out the first pitch, provided he uses the rosin bag beforehand and is thoroughly hydrated. Funny stuff — I especially like the unlicked ticket envelopes — and par for the course for the satirical savants within the Miracle front office. But this brings up the old debate: to what end? Much like myself at the junior prom, this promo is conspicuously lacking a date. 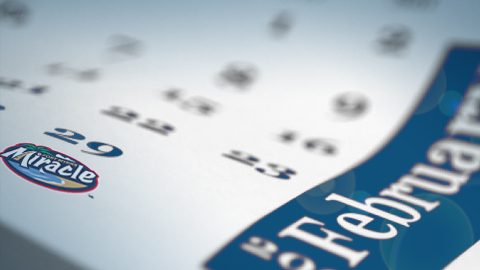 But even if it is scheduled in April it will most likely seem outdated and irrelevant by the time that it actually occurs. Barring a visit from Rubio himself, the number of fans who purchase tickets as a direct result of the Miracle’s pop culture riffing will be negligible. It’s possible that the team won’t have much of an incentive to execute the promo at all due to a lack of interest from the fans. But maybe that’s not the point? Simply by announcing the promo (and taking the time to brainstorm some clever components thereof), the Miracle have ample elicited media coverage/Twitter mentions/blog pontifications and perhaps the cumulative effect of this is a greater brand awareness that does in fact lead to more ticket sales. Or is that wishful thinking? What it the best way to quantify such endeavors, to determine if they are worth doing? Or, hell, maybe I’m thinking too much (per usual). 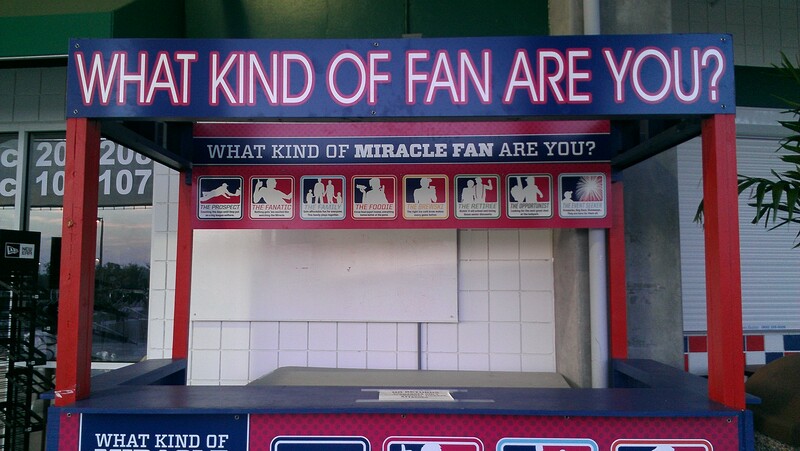 Maybe the best reason for the Miracle (or any team) to do promotions such as these is simply because they can. 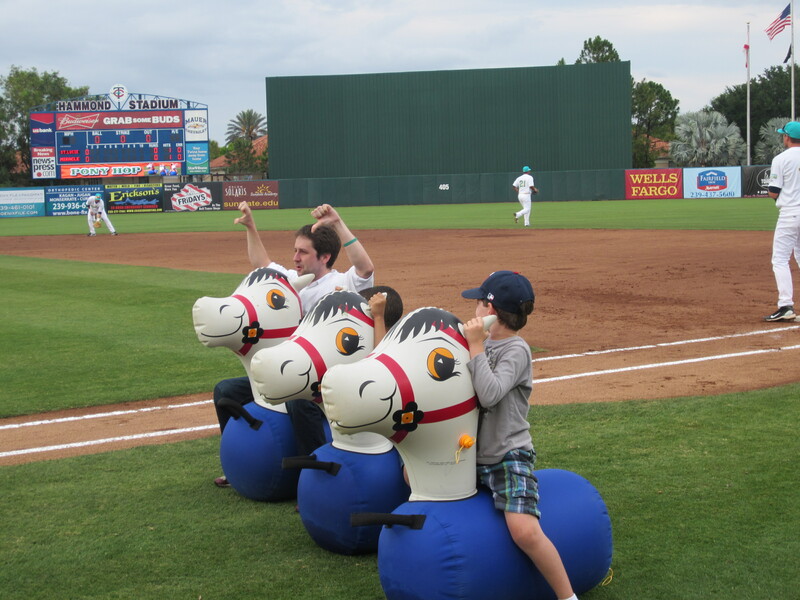 Unless you’re on the writing staff of a late night talk show, Minor League Baseball is perhaps the only industry where antics such as the above can legitimately be called part of one’s work day. And THAT might be what makes it worth doing, in and of itself. 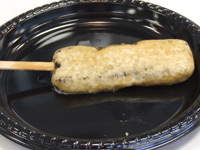 When I wrote my celiac disease “coming out” post back in early July, I made clear that I was still ready, willing and able to post any and all Minor League food pictures on this blog. 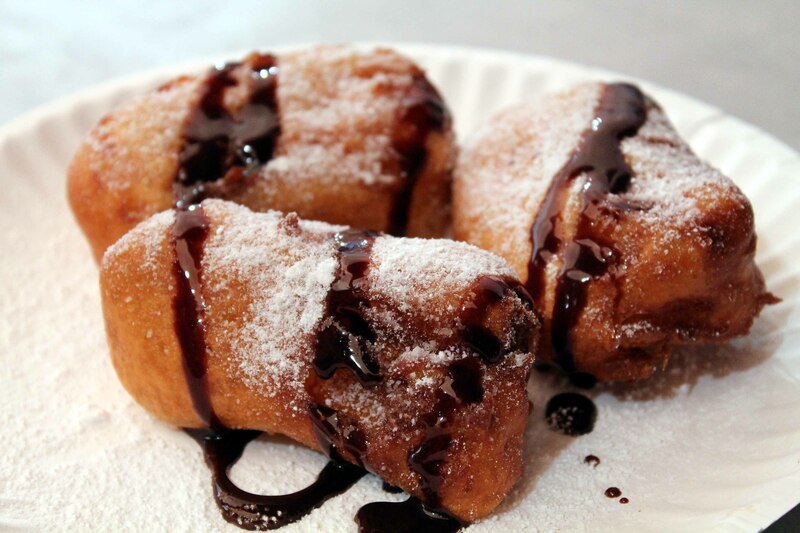 But actions speak louder than words, so let’s kick off today’s post with some deep-fried photography of a decidedly gluten-ous/gluttonous bent. 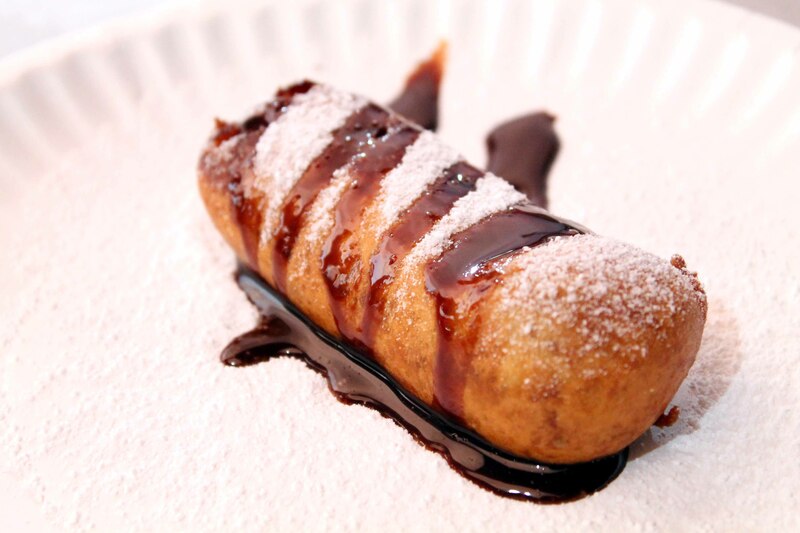 That would be a fried Snickers bar, just one of many delectable offerings that the Charlotte Knights served as part of a “Fried-day” promotion they ran this summer. 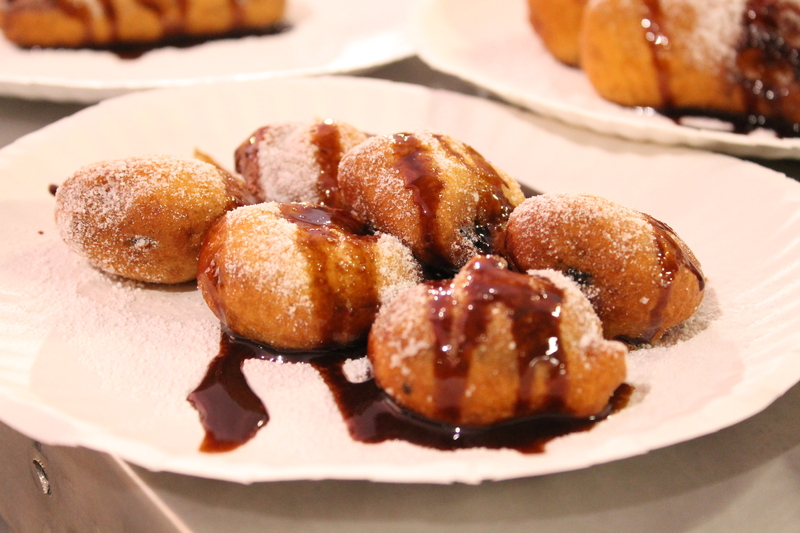 The team also served fried Oreos. 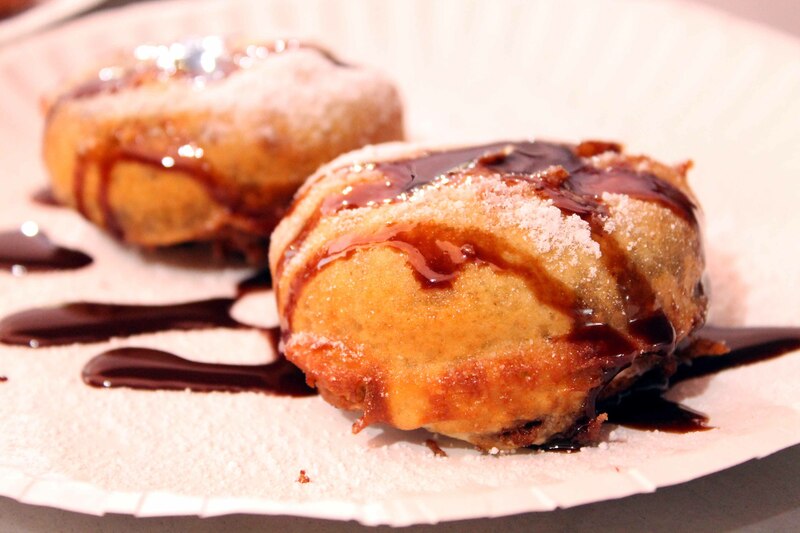 And fried S’mores were also on the agenda. 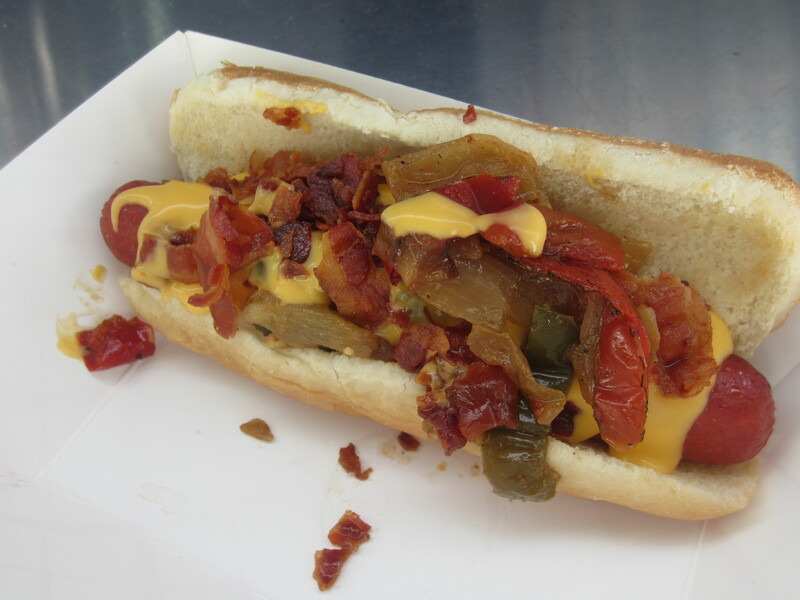 A decidedly less appetizing and far more ridiculous food-related item emerged in Fort Myers last month, as the Miracle staged a “Salute to Bacon” promotion. 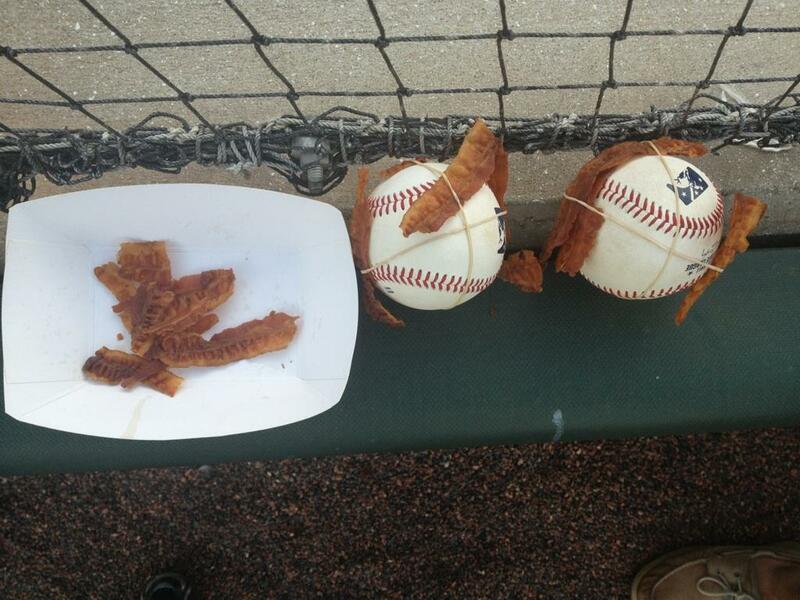 As part of the festivities, the balls used for the evening’s ceremonial first pitch looked like this. 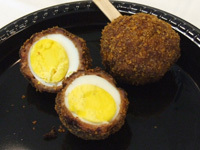 The Bacon Wrapped Eggs is muffin-sized and has a layer of pancake batter, crumbled bacon, a cracked egg surrounded by another strip of bacon, then topped with cheese and cooked to perfection. 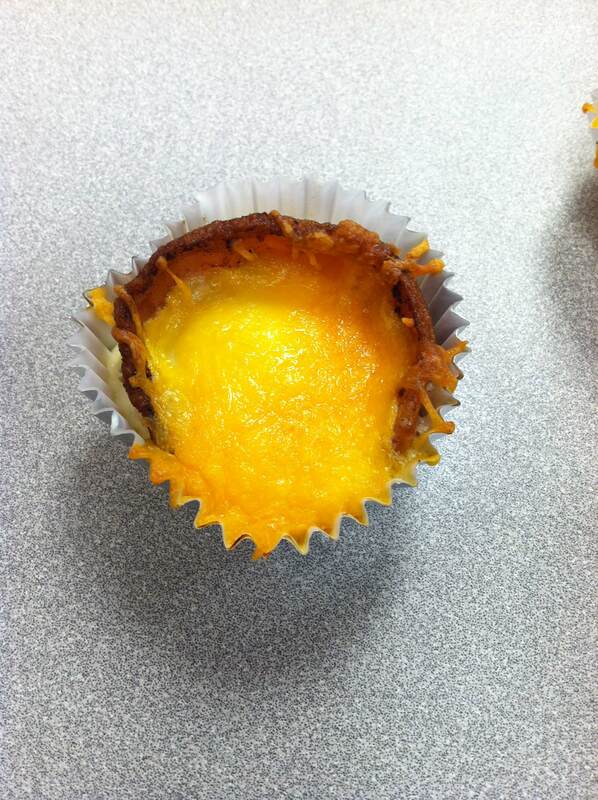 It will be sold for $2.50. 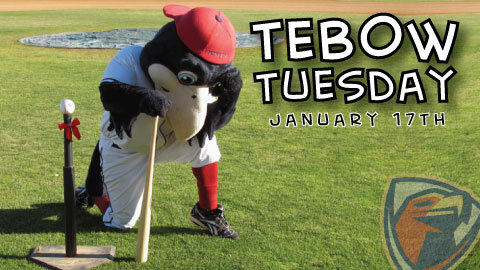 Run support won’t be the only thing providing a lift at TicketReturn.com Field at Pelicans Ballpark Thursday Night. 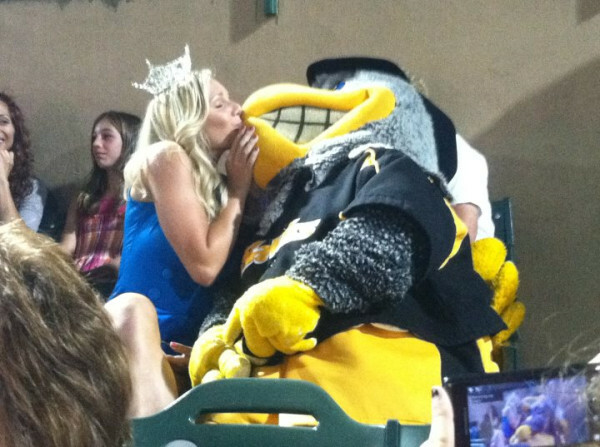 It’s Ladies’ Night and the Myrtle Beach Pelicans are giving away sports bras, courtesy of Carolina Coastal Plastic Surgery, to the first 200 women 18 and over. 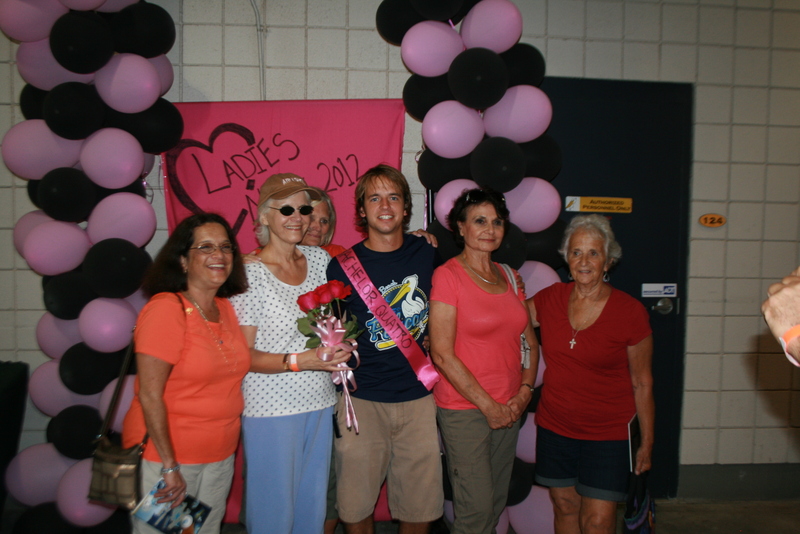 With new sports bras in hand, ladies can then bid on “dates” with eligible members of the Pelicans front office. 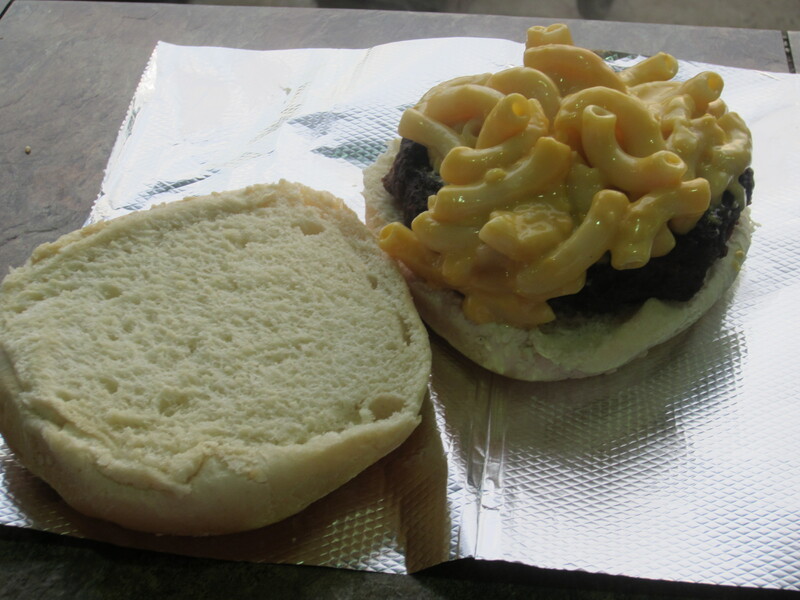 All proceeds will benefit the Bruce Dal Canton Fund to support students higher education goals in Horry County. Winning bidders can date their staff member for the last few innings of the game and then receive a prize pack including movie tickets for a real date night. Whether or not winners take their Pelicans staff members on those dates is up to them. In the history of Ladies’ Night, no staffer has been lucky enough for a second date. While I don’t have any photographs of the sports bras that were given away, let it be known that “Bachelor Quattro” was very much in demand. Okay, that’s it for me today. 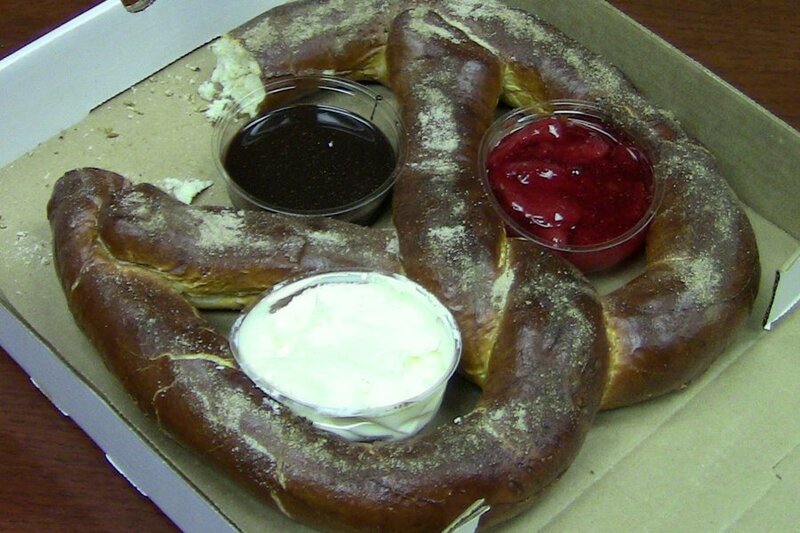 I wish I could end with a Zinger, something that would make you Snicker, but I just don’t have any S’more. 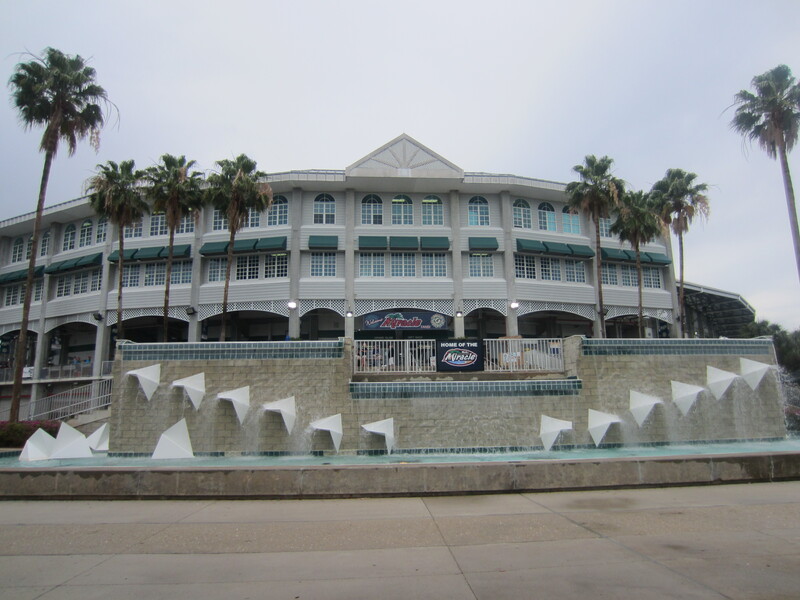 After spending Friday evening at the Clearwater Threshers game, I awoke early on Saturday morning to meet Dave Deas (a.k.a. 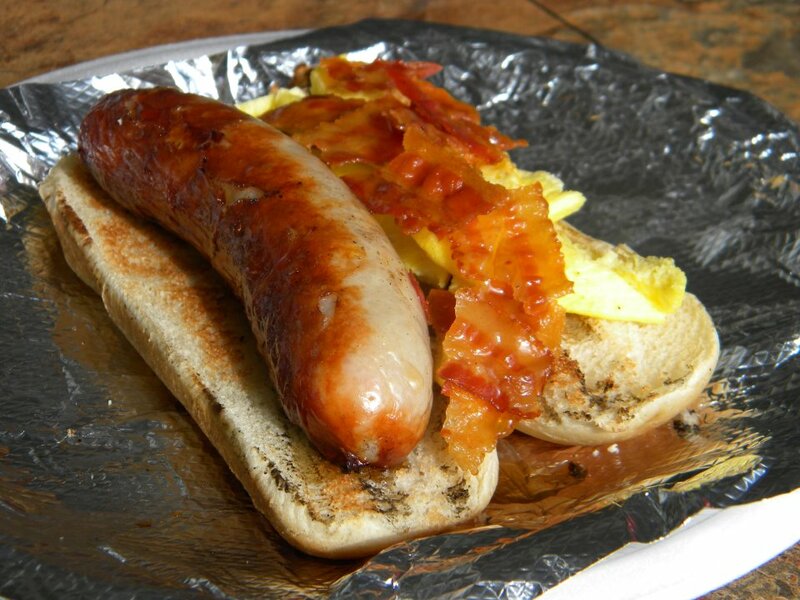 “Phinley”) for breakfast at the legendary Lenny’s. 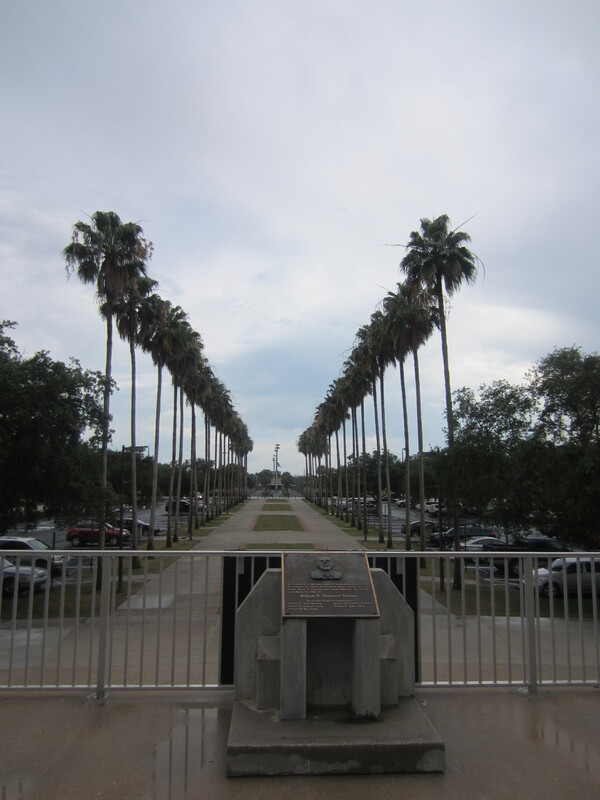 I then drove two hours south on 75 to Lee County, within which Fort Myers resides. After a relatively brief tour of JetBlue Park, new Spring Training home of the Boston Red Sox, I checked into La Quinta Inn (apparently one of the preferred hotels of the Florida State League) and geared myself up for the evening’s main event. 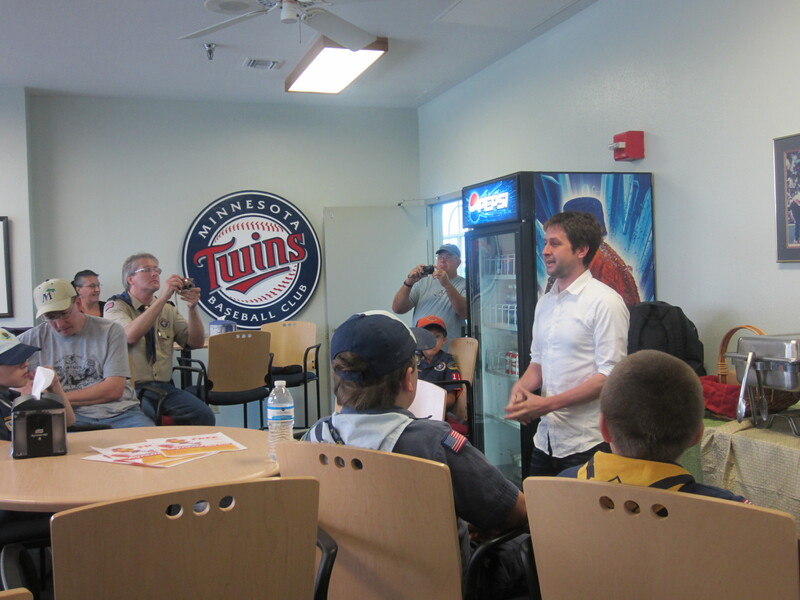 I arrived at the ballpark at 4 o’clock, just in time for an unprecedented commitment in my professional career: speaking to a Cub Scout troop. 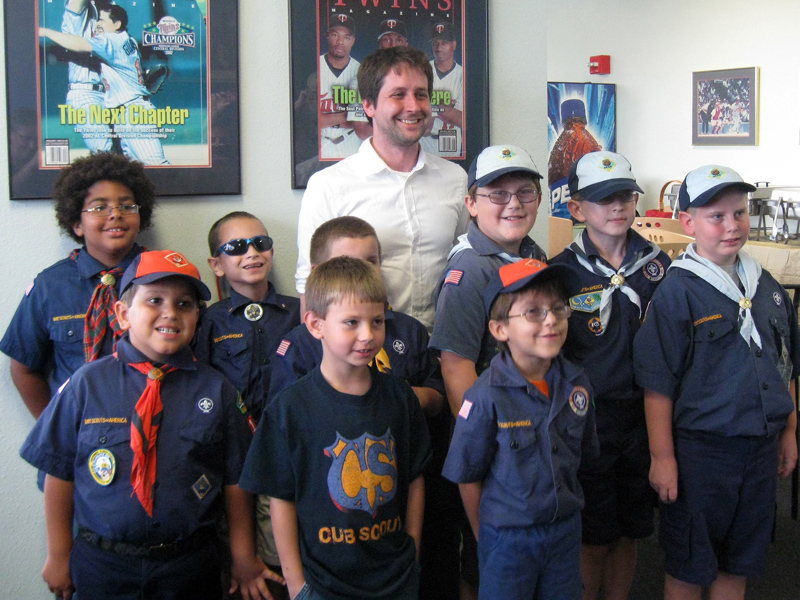 The invitation to do so came courtesy of loyal reader/former Miracle blogger Ed Pelegrino, cubmaster of Troop 110. I didn’t have prepared remarks or anything, I just spoke about my background, what it is I do and what brought me to this current reality. 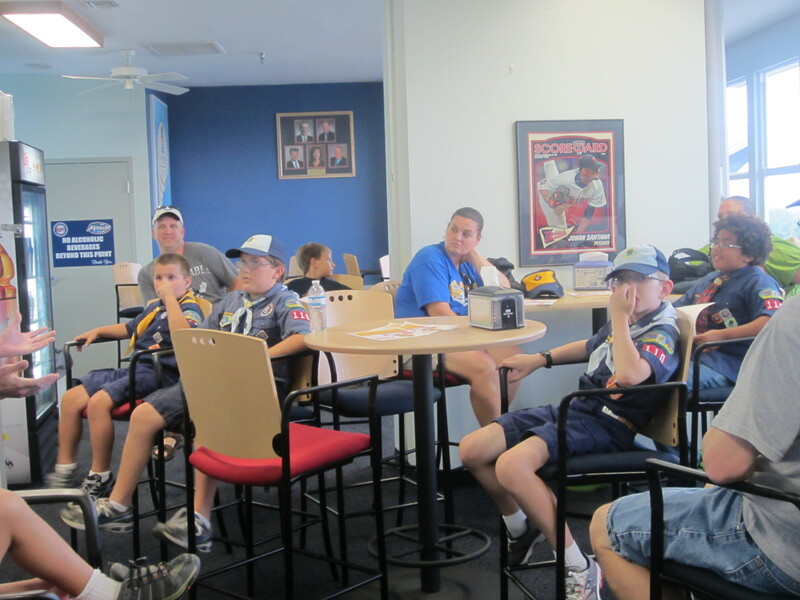 The underlying message was that there are ways to make a living in baseball above and beyond being a player. This next pic will probably always put a smile on my face. Thanks, pack 110! I then went in search of Miracle staff members, to be like, “Hey, I’m here. 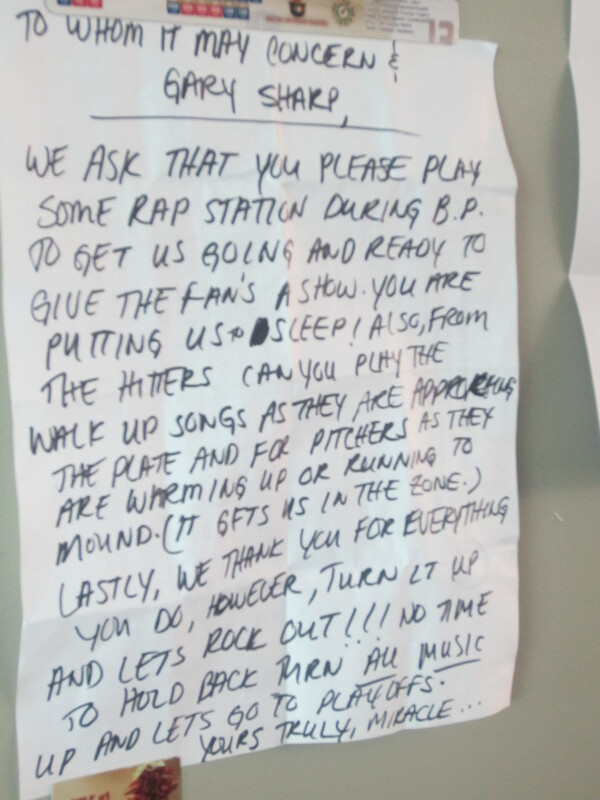 What indignities shall I suffer in the name of Minor League Baseball tonight?” The offices were largely deserted, but I did notice this hilarious piece of communication on the office door of promotions director Gary Sharp. 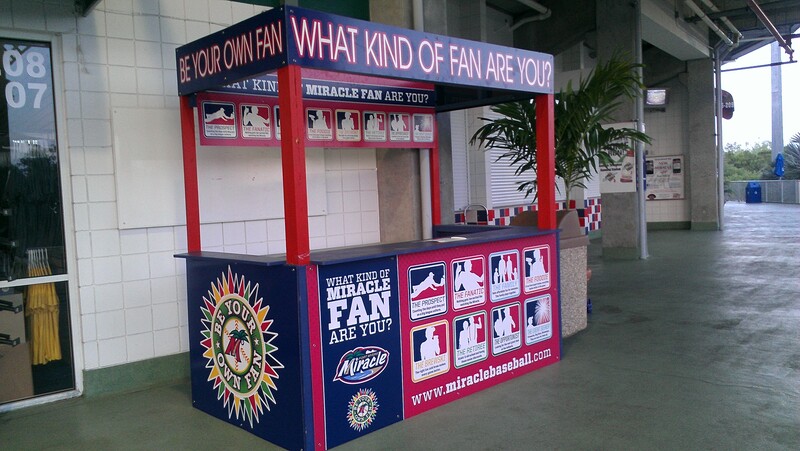 Back on the concourse, I signed up as an “event seeker” as part of the Miracle’s “Be Your Own Fan” initiative. (There are eight categories of fan, and those who sign up receive special offers tailored to their specific category.) In this picture I think I’m explaining that I wish I wasn’t as old as I actually am. And after talking with Sharp, I found out that he did indeed have many adventures planned for me. One look at the guy and you could tell he meant business. Clearly, ample sustenance was needed before dealing with the likes of that guy. 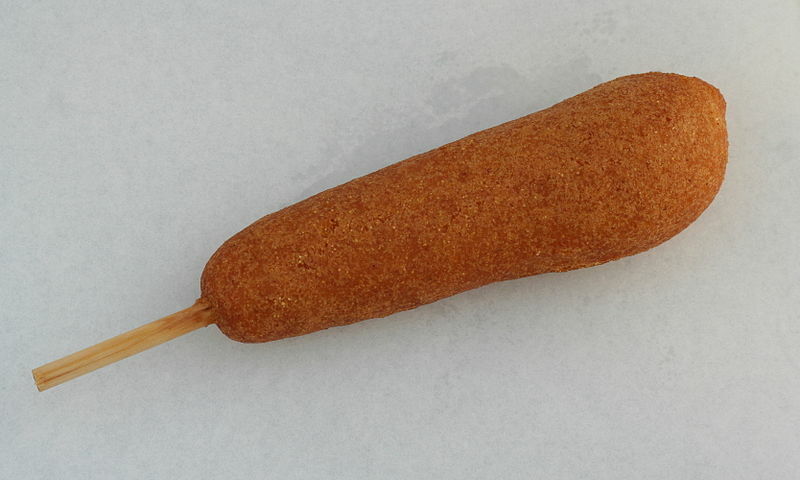 So I scanned the concession menu, and settled on the “Miracle Dog.” This is a DIY sort of a item, some assembly required. 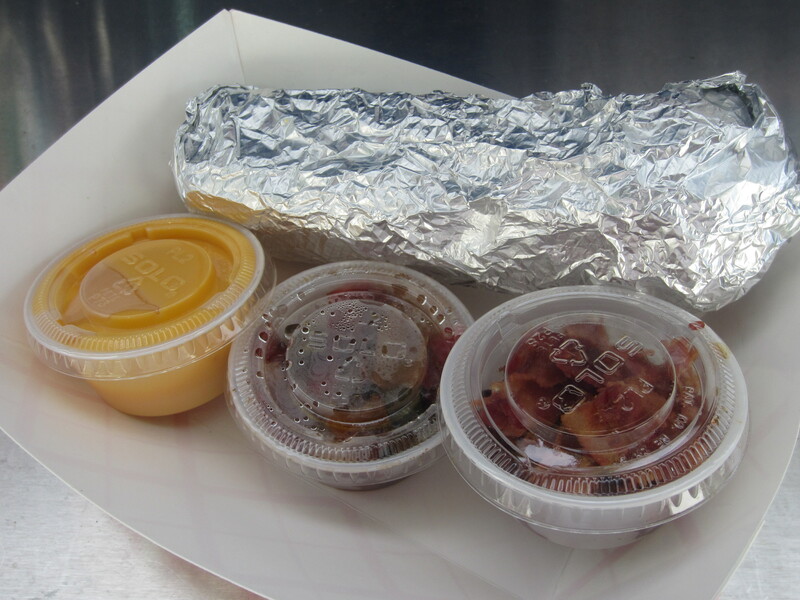 That’s bacon, nacho cheese, and peppers. I put on the nacho cheese first, so that it would serve as a bacon adhesive. Then, for the coup de grace, I dumped on the peppers. An extremely well-thought out strategy, one that resulted in the masterpiece you see above. 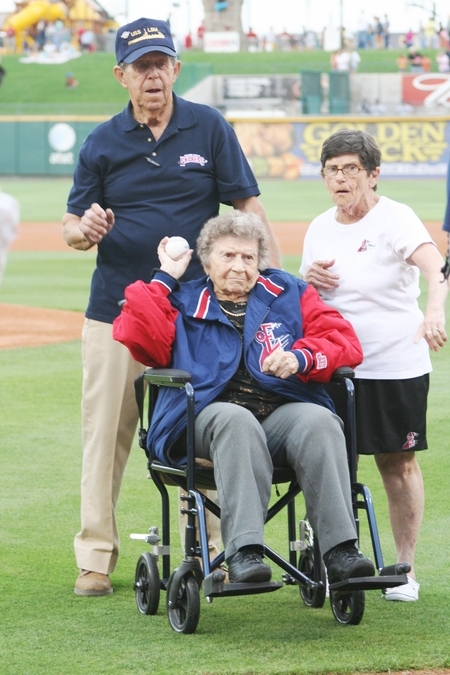 Confidence bolstered, I made my way down to the field to throw out one of the evening’s ceremonial first pitches. Miss-A-Miracle was glad to see me, but then again she’s glad to see everyone. The scene on the field was a colorful one, what with the orange and pink t-shirts, the Miracle’s yellow and teal throwback uniforms (they are worn every Friday and Saturday home game this season), and the green grass. It was like a rainbow down there, I tell ya. A rainbow. 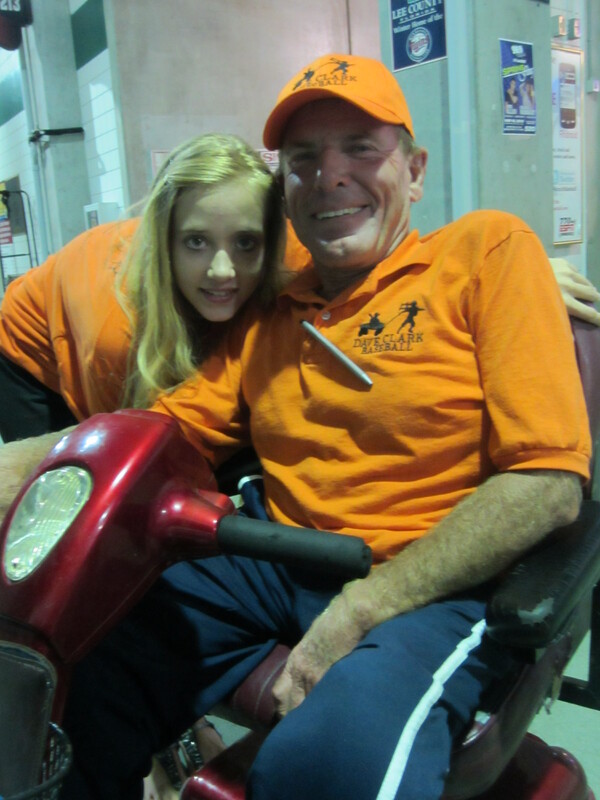 The orange shirts were worn by individuals involved with the Dave Clark Foundation, which had staged a remarkable event that morning. 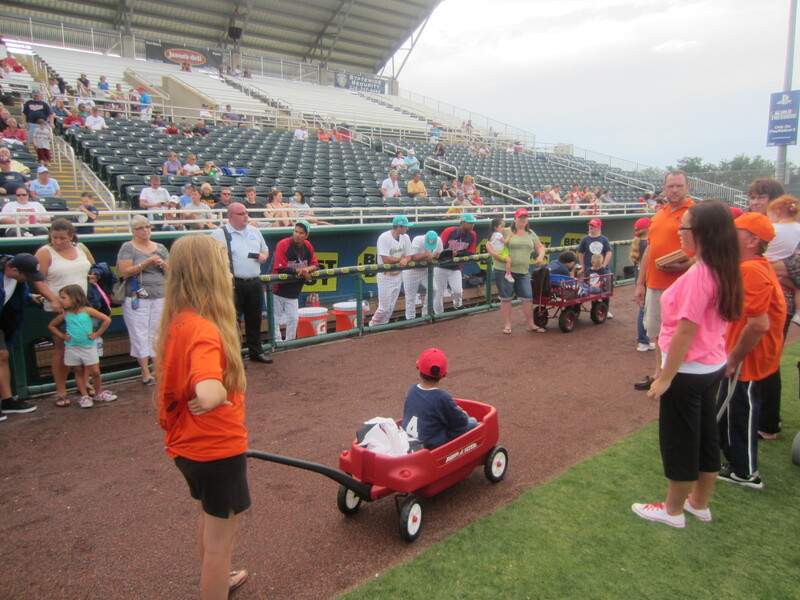 The entire Miracle team and coaching staff joined 24 disabled children on the field, giving them one-on-one instruction and helping to stage a game. 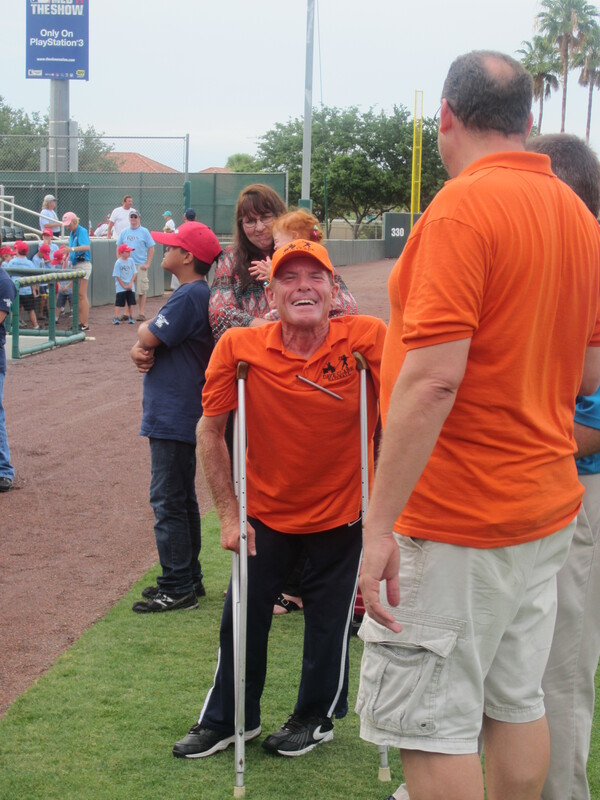 I interviewed Clark later in the evening, and his story is absolutely remarkable (he had polio as a child, and went on to pitch professionally while on crutches). I’m going to postpone my story on him and his Foundation and their work with the Miracle until after I return from the road, so that I can give it the full attention that it deserves. In the meantime, here’s a picture of Dave Clark (sans five). 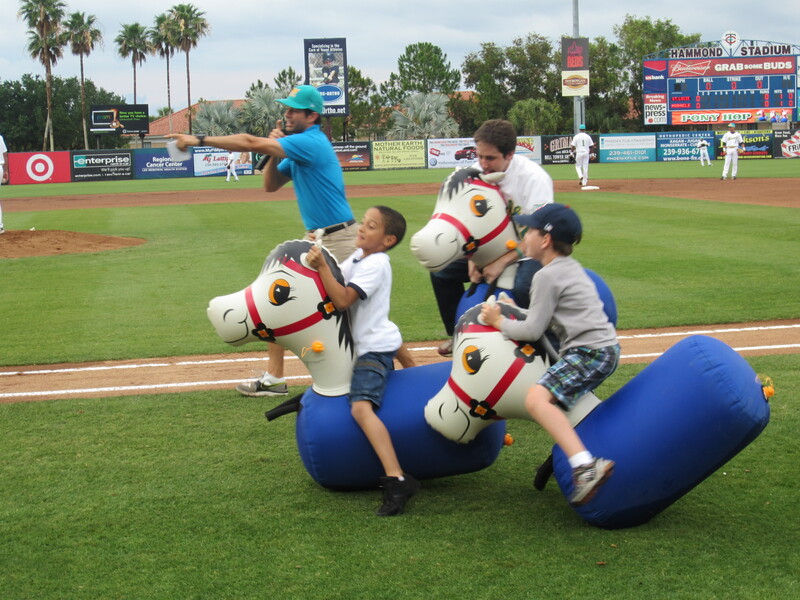 With the game underway, my first task was to take on these two young gentleman in an onfield inflatable pony race. You’re going down, kids! 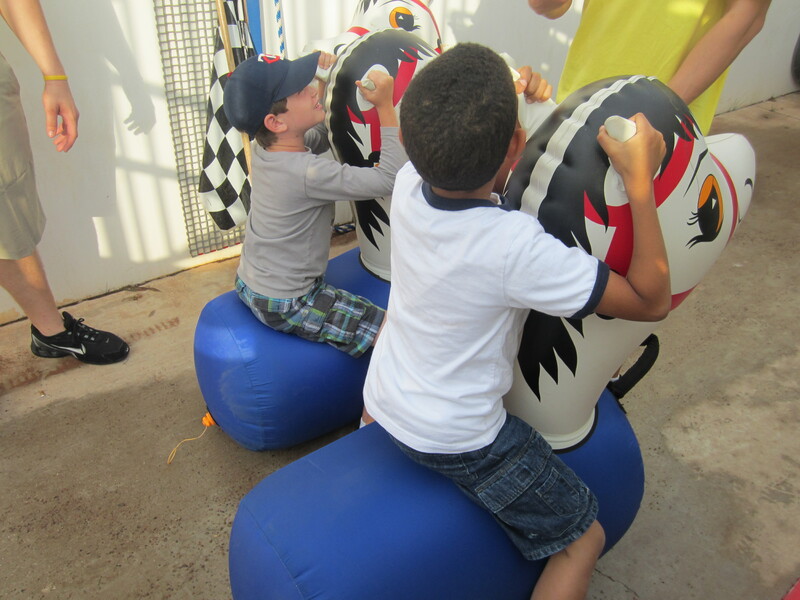 …and with that, it was off to the races. It was a close-fought contest, in which I honed the techniques I learned in Lake County last season, but in the end I lost. I usually do. Congratuations, kid #1. 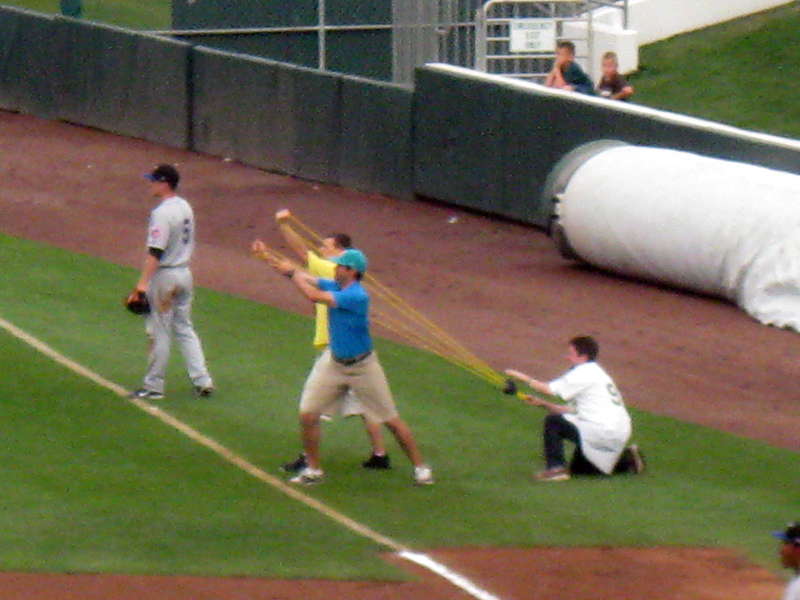 Next up on the agenda was to use a slingshot to launch a beanbag onto a target placed on the outfield grass. ( If memory serves, this was indeed the actual name of the game.) Would you believe that I was unsuccessful? 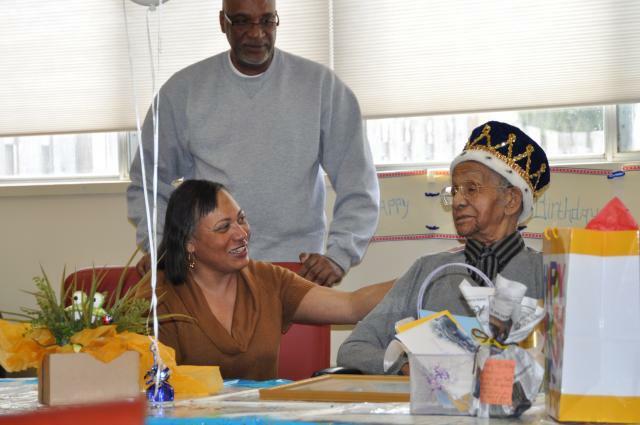 The Miracle announced this last week, and it generated a lot of media attention. Here’s how: they tweeted the idea, I re-tweeted it, and a Baseball Prospectus writer saw my tweet and brought it to the attention of a Yahoo! blogger. Yahoo! did a blog post on it, which in turn led to a FoxSports article which in turn was basically re-written by USA Today. And so on and so forth. The moral of the story is that I am the greatest of all time. 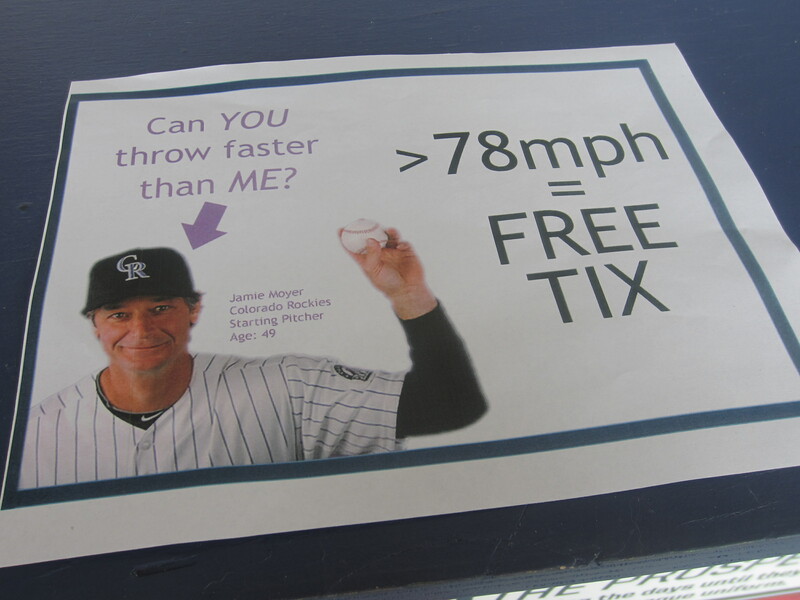 And, also, that my fastball is apparently 44 miles an hour. 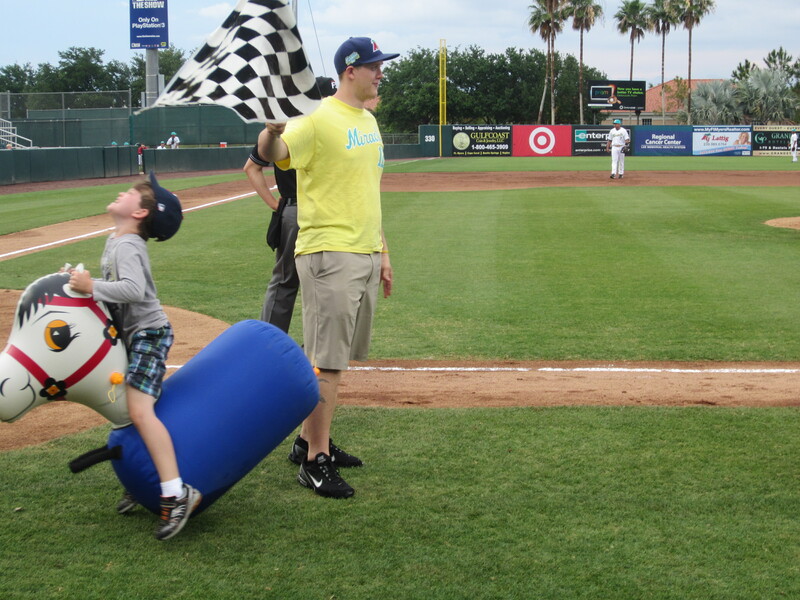 MLB.com’s Adam Berry happened to be visiting in order to write an article on the Miracle’s Moyer phenomenon (which, in actuality, amounts to two goofy flyers taped to an inflatable speed pitch game). 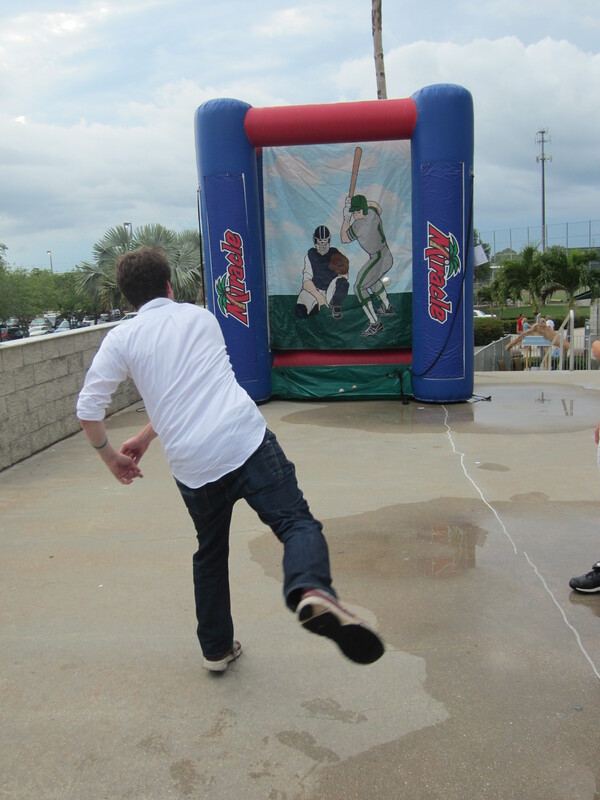 Here he is throwing about as “fast” as I did, and his story can be found HERE. 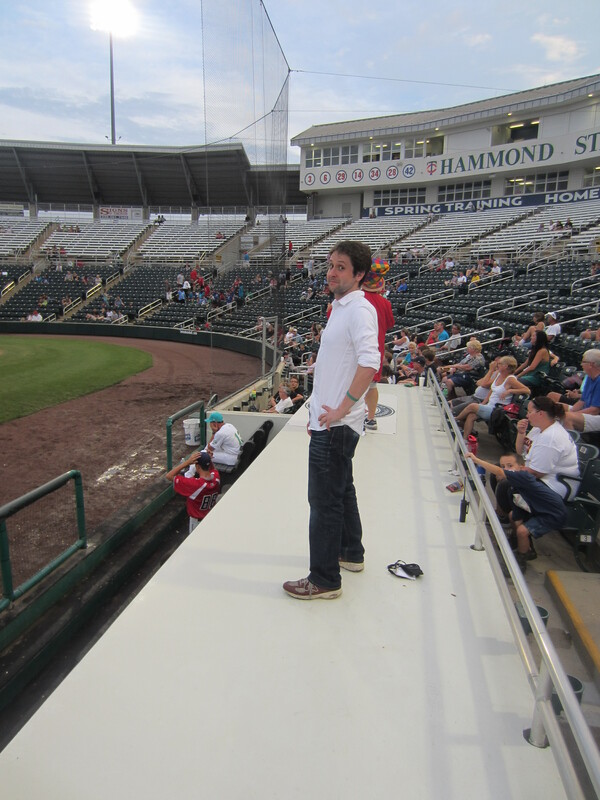 My final on-field appearance was atop the third base dugout, as part of a “sing-off” against the third base side. Basically, it amounted to me singing “Born to be wiiiilllllld” at an appropriate moment. After the Miracle Dog, did I need more food? No, I did not. But a stop at the Char Bar happened nonetheless. 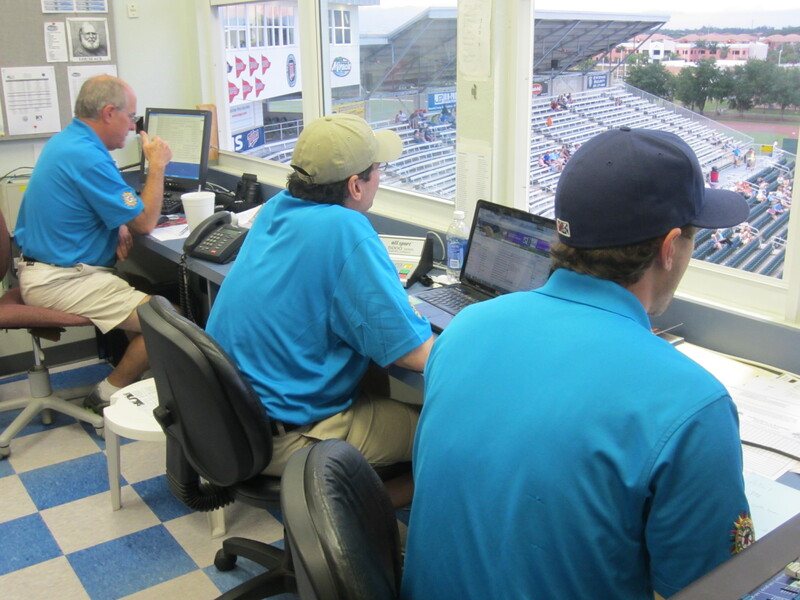 Scott Pedersen, official scorer, is the man in the middle. My “decisions” were as follows: F7, K, K. No fuss, no muss.! 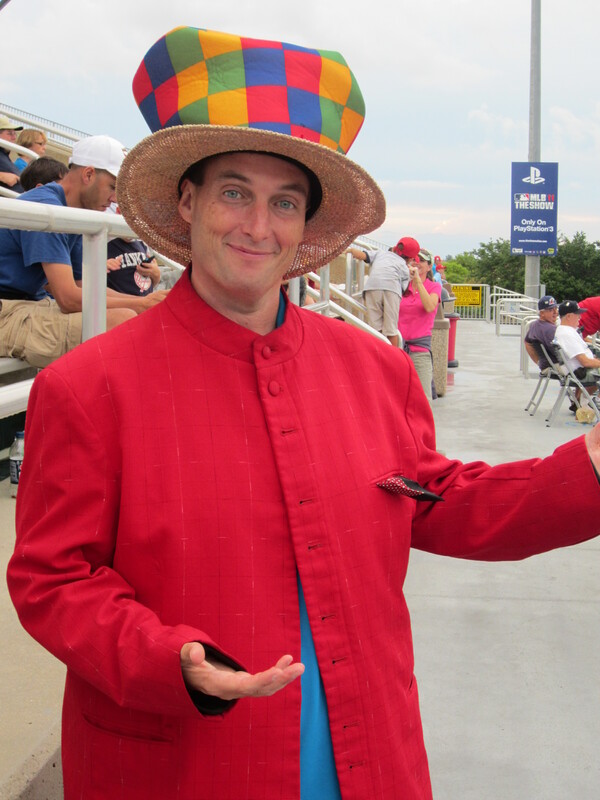 Slightly dicier was handling PA announcing duties, as nearly every batter I announced was of Latin origin and therefore possessing a name with silent letters and, to me, unknown syllabic emphasis. 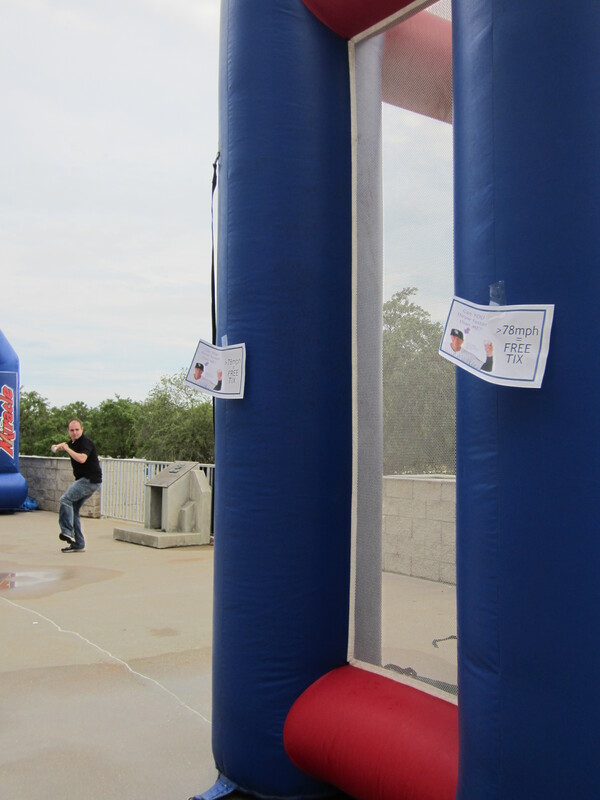 But I got through it alright, and even aced a Wells Fargo ad read during a pitching change. 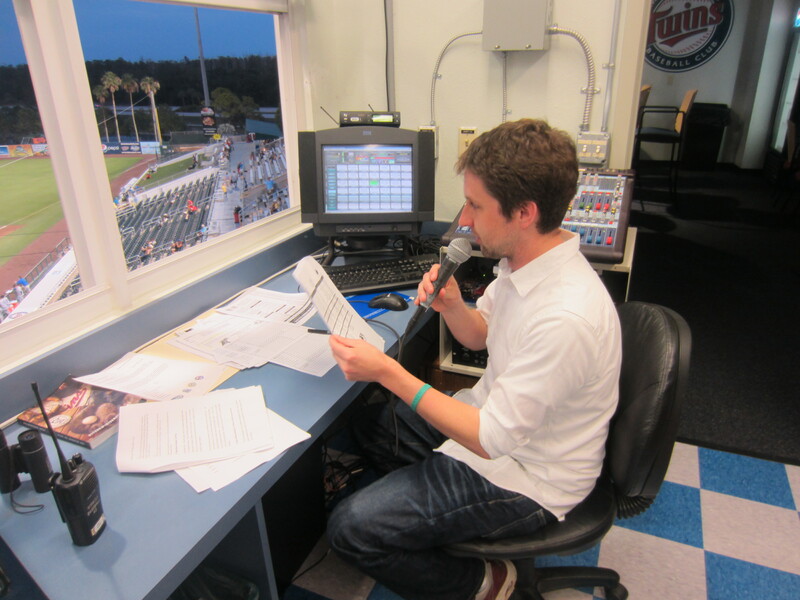 Finally, I joined announcer Brice Zimmerman in the announcing booth for a long and exceedingly sloppy seventh inning. He let me attempt play-by-play on several occasions, and it was pretty brutal. 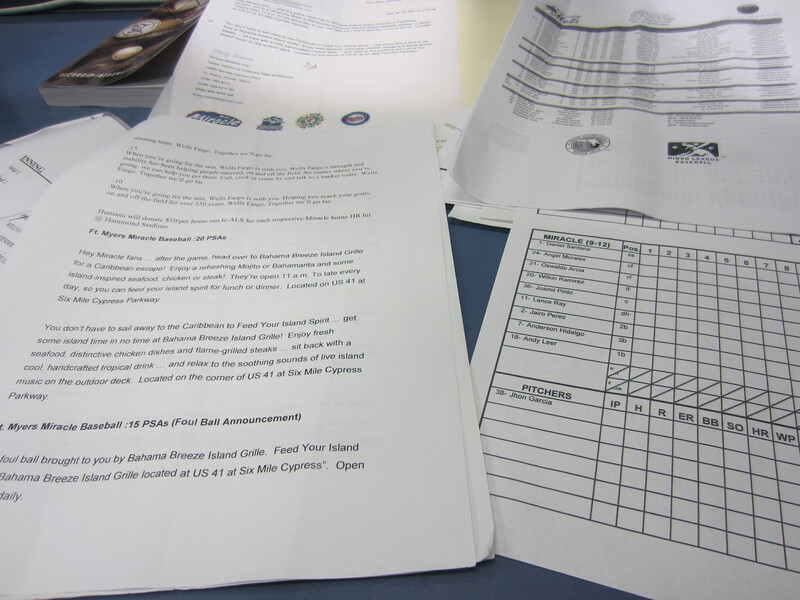 This was an inning with rundowns, errors, suicide squeezes and more – a lot of crazy stuff happening in a short period. I was reduced to descriptions like “The ball is hit. Uh-oh! (long pause) Wow!” Stay tuned for the audio. 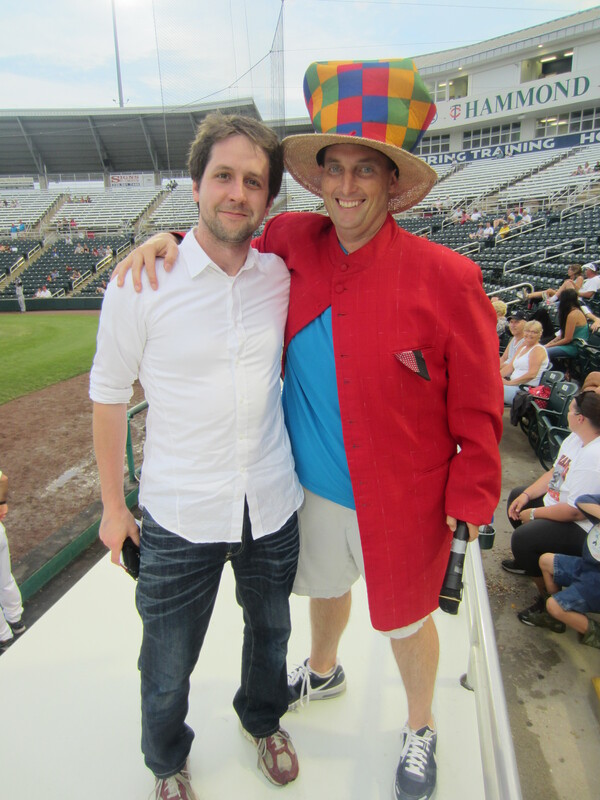 But I did enjoy speaking with Zimmerman: explaining what it is I do, the specifics of this current road trip, and how dignity is optional when I’m at the ballpark. Thanks for having me on! There wasn’t much left for me to do at this point, so I reverted to taking pictures while inside the men’s room. 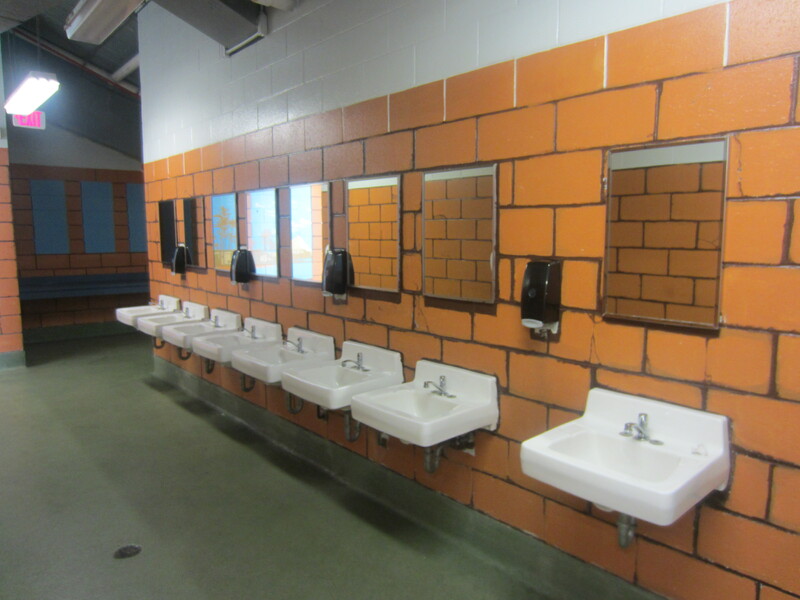 I thought it was funny how, instead of mirrors, the team installed framed pictures of orange bricks. 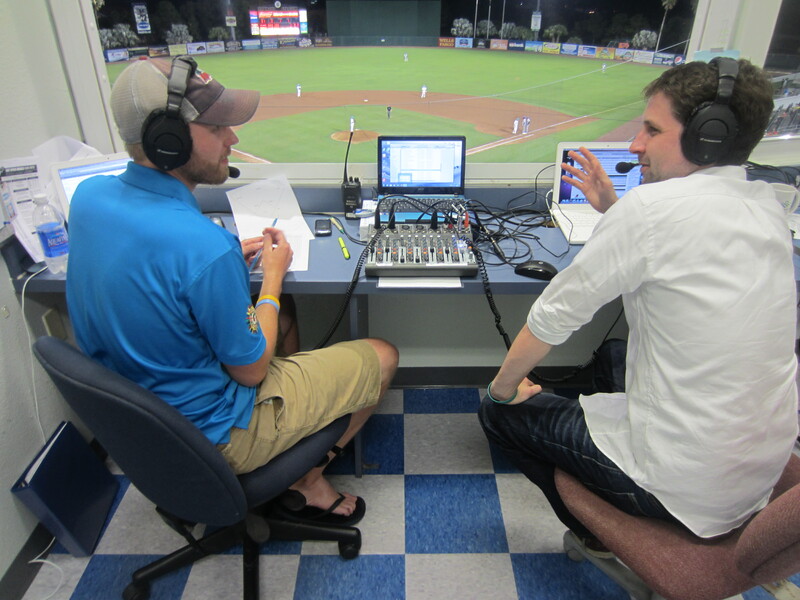 Soon after I was done speaking with Clark, the visiting St. Lucie Mets emerged triumphant in the ballgame. 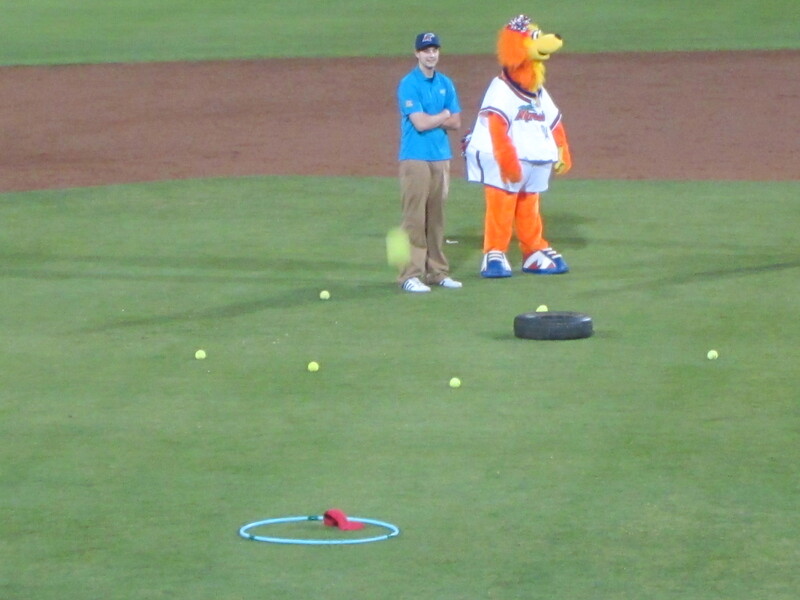 That left one thing left to do, and one thing only: Launch-A-Ball! 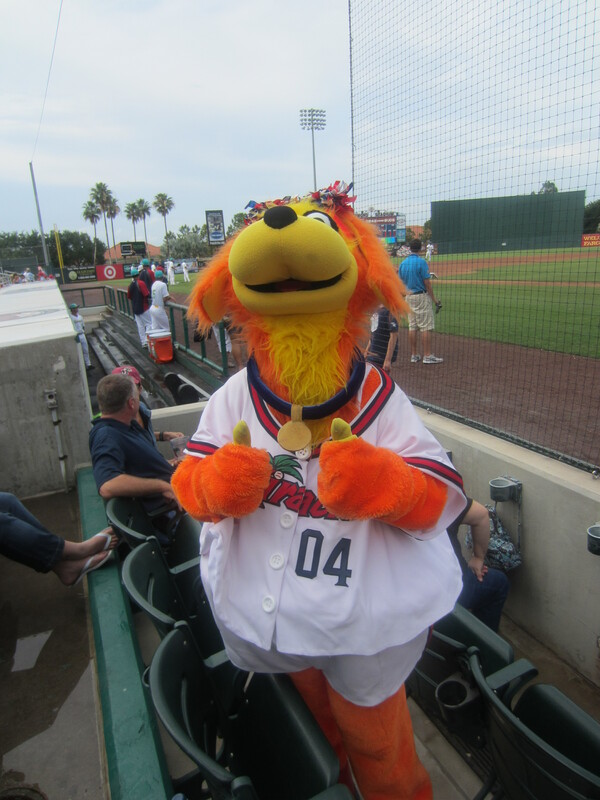 Goodnight, Fort Myers, and thanks for the hospitality. You may remember that I wrote about this Blue Wahoo a few weeks back, when he was nothing more than an artist’s rendering in search of a name. 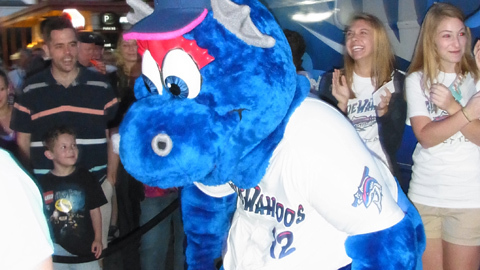 He has since been bestowed with a moniker, and will forevermore be known as “Kazoo.” Interestingly, the Blue Wahoos are referring to Kazoo as a “fictional aquatic creature” despite the fact that he clearly exists. 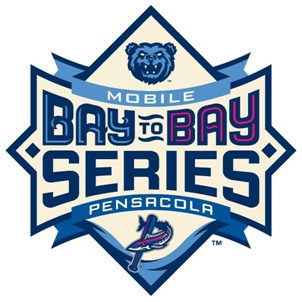 The Blue Wahoos are entering their inaugural season, but thanks to the inexorable passage of time they’ll eventually be celebrating anniversary seasons of varying degrees of importance. And when they do, there’s a good chance that they’ll put in a call to Studio Simon. I was recently alerted to the fact that this Louisville-based logo powerhouse has had a hand in three recent anniversary marks, celebrating seasons from 10 to 20 to 60. I’d say that the above image is pretty much the definition of “self-explanatory.” So let’s move on. 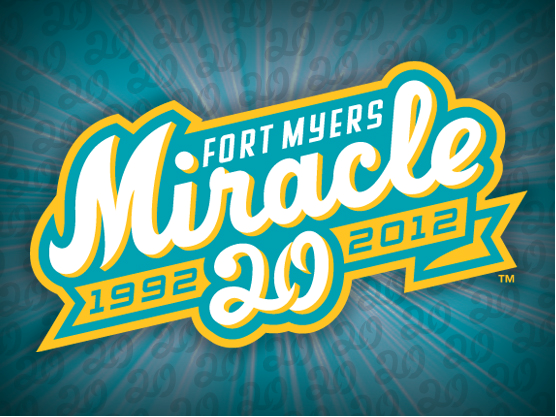 The Miracle mark features the script font, and the teal and yellow color palette, that the team sported when they first moved from Miami to Fort Myers in 1992. In fact, the team wore those colors for at least several campaigns before the move, which means that it was them, and not the team formerly known as the Florida Marlins, who deserve credit for officially bringing teal onto the baseball branding landscape. 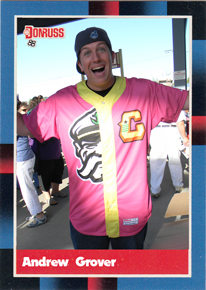 As part of their 20th anniversary celebration this season, the Fort Myers Miracle will be wearing throwback uniforms from 1992, their first year in Fort Myers after their move from Miami (a move necessitated by the fact that the Florida Marlins were taking over the Miami territory, starting in 1993). 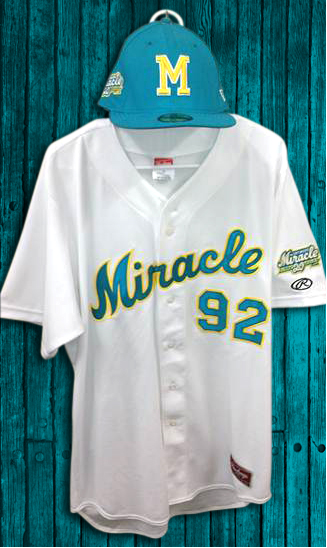 The Miracle will be wearing the teal and yellow caps and jerseys for every Friday and Saturday home game during the 2012 season. There will be a season-long jersey auction that will conclude at the final home game on September 1, when the highest bidders will win the jerseys. A portion of the proceeds from that auction will benefit the Dave Clark Foundation, which as Simon notes, should “make you ‘Glad All Over.‘” That one deserves a high 5! I did write about that one already, but the above image is superior to that which I had before. 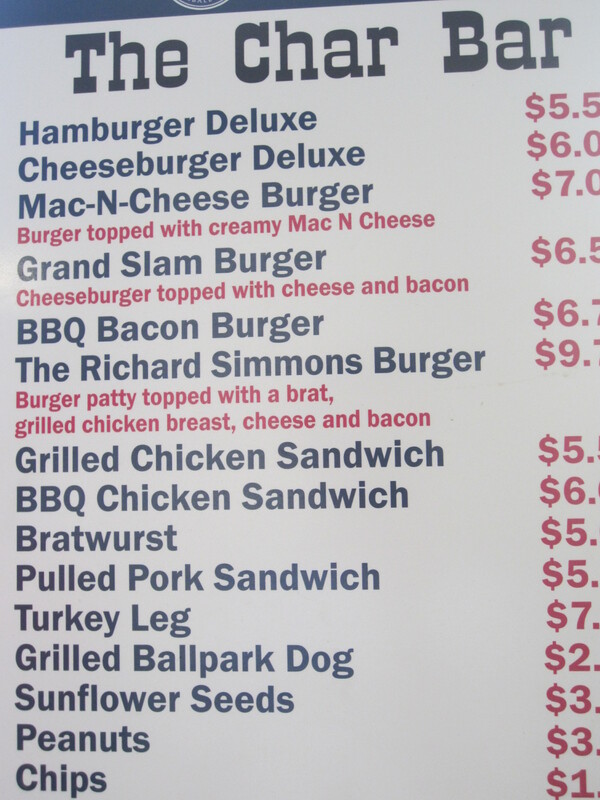 And here at Ben’s Biz Blog, you know we only settle for the very best. 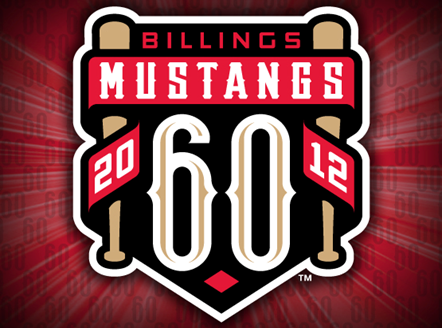 One thing is bothering me, though: is there a word for “60th anniversary”? If this was a 50th anniversary then I’d have the chance to drop “quinquagenary” and 75 brings the opportunity for “dodranscentennial.” But, for now, I’m at a loss for words. Maybe it’s an example of my sticktuitiveness, maybe an example of stagnancy. Probably both. But, at any rate, I am able to begin today’s Leap Year post by looking at what I wrote about 2/29 the last time it rolled around. So let’s leap to it! San Jose's got the spirit! The year was 2008. 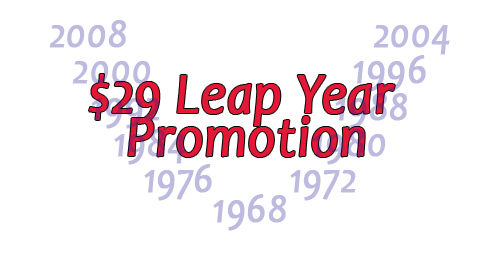 While most Americans were busy listening to the 10th anniversary edition of the Baha Men’s epochal Doong Spank LP, the Lancaster JetHawks made their presence felt by staging a Leap Year promo. 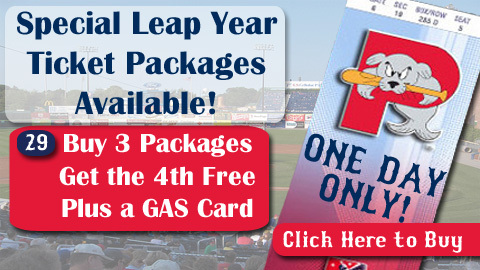 Most notably, all fans with a leap year birthday received a box seat season ticket! 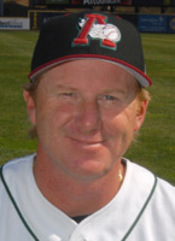 Not to be outdone, the Altoona Curve soon announced a season-long “Leip Year” celebration, all in honor of skipper Tim Leiper. This one had the Rainmain-like fixation on numbers that is a hallmark of any good Minor League promotion, including the provision that if any Curve player was batting .366 after April 29’s ballgame, he (or she, you never know) would be awarded $366. Most notably, the above deal includes a $29 Citgo gas card. 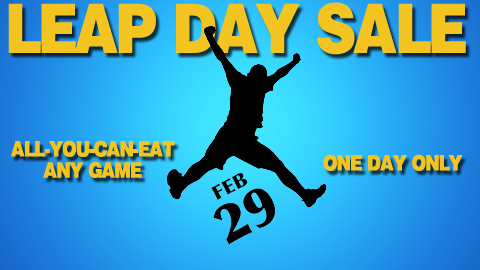 $17 all-you-can-eat seats, to any game. I’m just not sure who would want to eat seats in the first place, though. More bang for the buck than a bringing an exploding dollar bill along on a deer hunt! 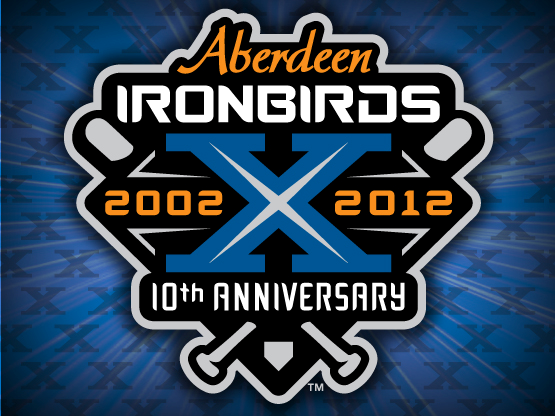 $29 gets four tickets to exhibition game vs. Triple-A Sacramento, four ticket vouchers to opening weekend, and two souvenir caps. Interesting twist to this one, in that the $29 ticket packages includes admission to all games falling on the 29th of the month. 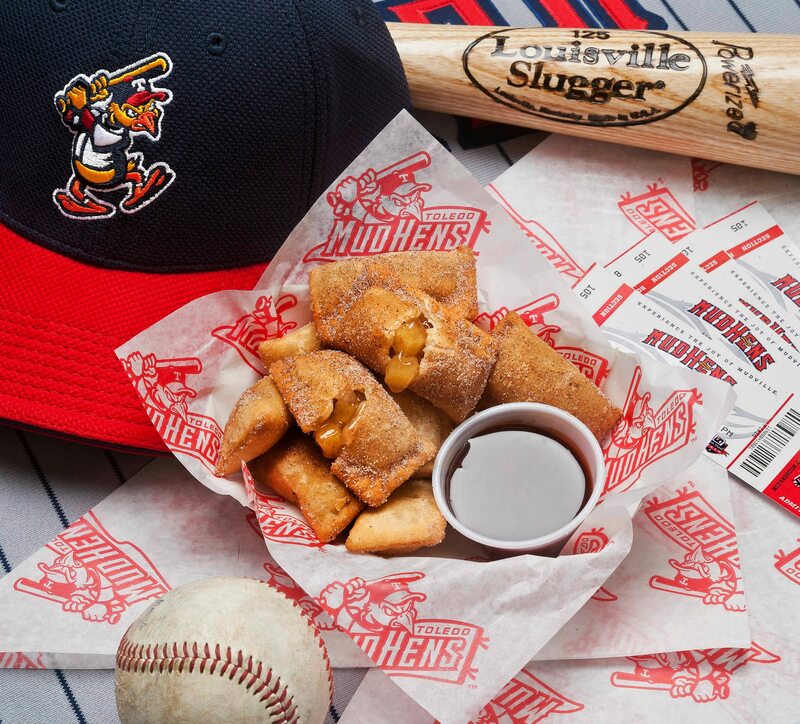 This offer comes with a $29 concession stand credit. 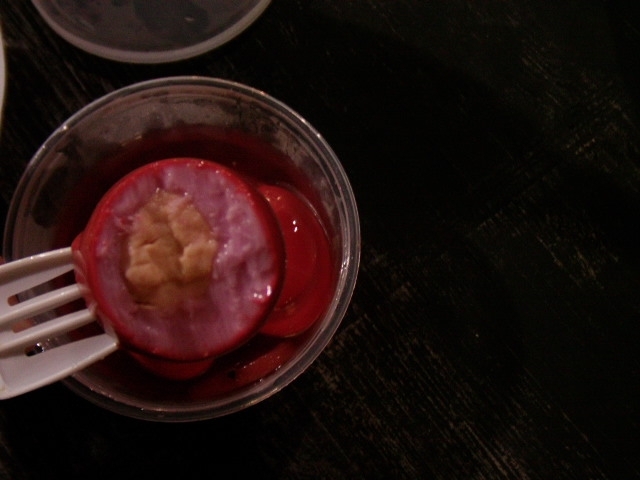 Beet eggs included? 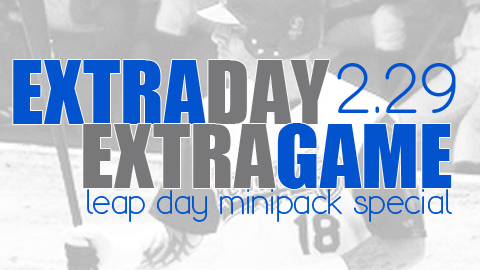 Two extra games included with the purchase of a five or 10-game pack! 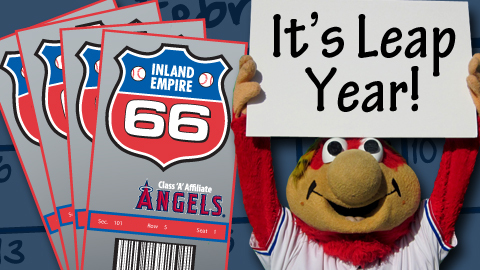 Buy a six or 12-game ticket pack, get an additional game free. 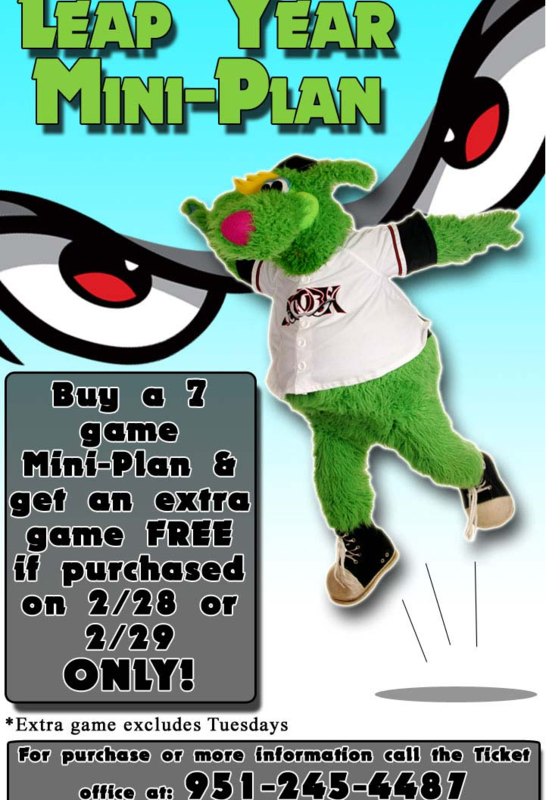 This concludes THE MOST COMPREHENSIVE RECAP OF MINOR LEAGUE BASEBALL LEAP DAY PROMOTIONS EVER ASSEMBLED. And yet I still don’t have my own Wikipedia page.